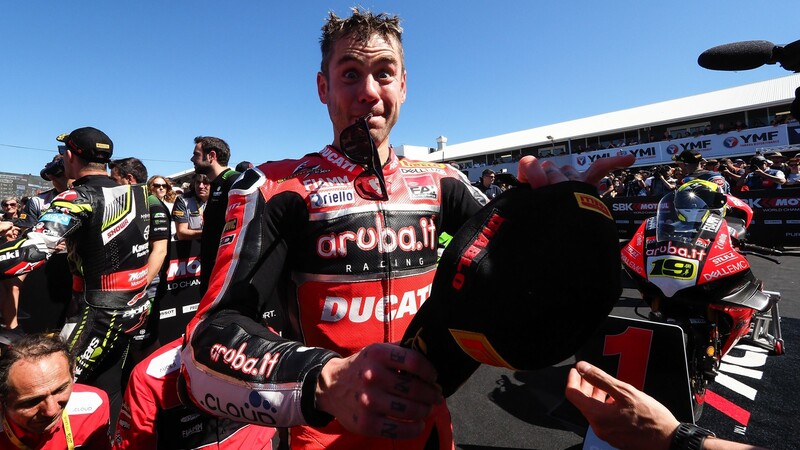 The opening race of the 2019 MOTUL FIM Superbike World Championship was a classic and went the way of Rookie, Alvaro Bautista (ARUBA.IT Racing – Ducati), who set a scintillating pace and was able to clear off at the front of the pack from lap one. Bautista took the win in a convincing manner, winning at more than 15 seconds to become the first rookie to win a WorldSBK race on his debut since Max Biaggi in 2007. Off the line for the first time in 2019, Leon Haslam ( Kawasaki Racing Team WorldSBK) got a good start before being sandwiched into Turn 1 by Alvaro Bautista and early race leader and policeman, Jonathan Rea (Kawasaki Racing Team WorldSBK). However, Bautista soon blasted into the lead at Turn 3 and from there, built a gap, setting back-to-back fastest laps and before half-race distance, the 34-year-old had a gap or over eight seconds. The race evolved and started to take shape, with the KRT WorldSBK pairing of Rea and Haslam exchanging position frequently , while Tom Sykes and Alex Lowes also battled. Razgatlioglu made massive progress through the field and became fourth place with an exciting move into Turn 1. It wasn't long until the first race crashed the year with Leon Camier at Turn 2 (Moriwaki Althea HONDA Team). 19659002] With Leon Haslam managing to get ahead of Jonathan Rea and pull clear, disaster struck for the former WorldSBK runner-up, as he crashed out of second at Turn 4. 'Pocket Rocket' Haslam eventually finishing 15th. This left Jonathan Rea and Alex Lowes at the front of the battle for second position, while Toprak Razgatlioglu and Tom Sykes battled hard. The BMW of Sykes struggling to keep Toprak's Kawasaki behind it on the front straight but then managing to get back ahead at the hairpins. Later in the race, Marco Melandri started to make big in-roads to Dutchman, Michael van der Mark (Pata Yamaha WorldSBK Team). It was long before the Italian made its move into sixth place and then chased down the riders ahead of him. Soon, he got ahead of Tom Sykes and then Razgatlioglu at Turn 2 with six laps left, releasing him into clear air to hunt Alex Lowes and the final spot on the podium. At the flag and Alvaro Bautista romped home with 14.9s to spare, a remarkable achievement; one that echoed Anthony Gobert's dominant victory at the Phillip Island Grand Prix Circuit in 2000. Jonathan Rea took second position and conceded the first race of the season for a second consecutive year. The battle for third saw in remarkable effort from Marco Melandri flourish, able to get ahead of Alex Lowes to take the final position on the podium. Michael van der Mark took fifth place to make it three Yamaha riders inside the top five, whilst Toprak Razgatlioglu completed the top six ahead of Tom Sykes. Sandro Cortese (GRT Yamaha WorldSBK) was top German in the eighth place ahead of Michael Ruben Rinaldi (BARNI Racing Team) and a disconsolate Chaz Davies (ARUBA.IT Racing – Ducati) in tenth, some 27 seconds behind his victorious teammate. With the first race complete for 2019, Alvaro Bautista breaks many records. He is the first Spanish Rookie to set a fastest lap at Phillip Island on a Ducati since Ruben Xaus in 2001, while also becoming the first Spanish rider to win a WorldSBK race since Jordi Torres in 2015 at the Losail International Circuit in Qatar. You can see if anyone can take it to Alvaro Bautista on Sunday with our WorldSBK VideoPass!